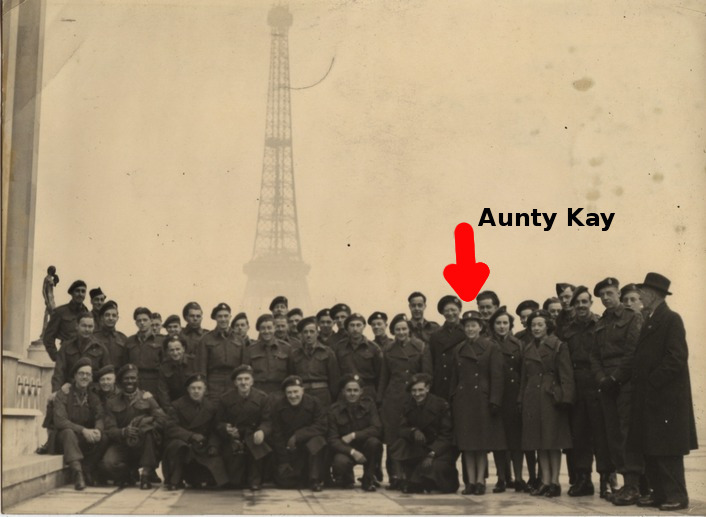 On this day in 1945 my Aunty Kay got away from the drudgery of her administrative posting with Canadian Army Headquarters in Aalst, Belgium, and took 48-hour leave in Paris. She had an awesome time and a few days later wrote all about the experience in a letter to her Ma and Pop (my great-grandparents) and her broth er Mike back home. (Mike had flat feet and was rejected for service, so his main contribution to the war effort was sending his sister cartons of Export A cigarettes on a regular basis). I don’t really remember Kathleen Bublick (I only met her when I was a baby), but I am fascinated by her short life and adventuresome spirit. 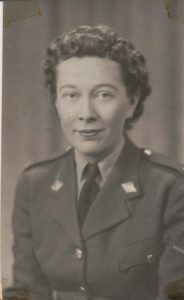 She worked her way up to the rank of sergeant in the CWACS (Canadian Women’s Army Corps) in London during WWII and dearly wanted to get across to the Continent after D-Day, but the quota of sergeants had already been filled so she took a voluntary reduction in rank back down to private in order to join the advancing Canadian Army. She eventually made it all the way to Germany, and stayed there long after V-E day taking care of the paperwork that transferred Canadian soldiers home or else to the still ongoing Pacific Theatre. 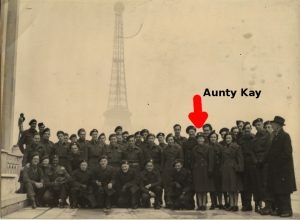 I have a lot of information about Kay’s life that I want to share eventually. I am waiting for Archives Canada to fulfill my request for her military dossier, but I’m not expecting that for another 6 months. 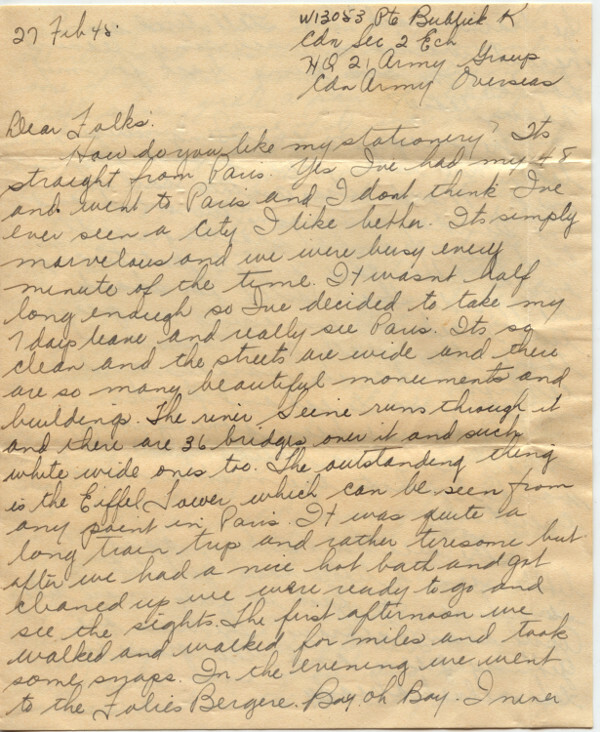 In the meantime, to commemorate the 74th anniversary of her adventure in Paris, I’ll post her letter home. How do you like my stationary? It’s straight from Paris. Yes I’ve had my 48 and went to Paris and I don’t think I’ve ever seen a city I like better. It’s simply marvelous and we were busy every minute of the time. It wasn’t half long enough so I’ve decided to take my 7 days leave and really see Paris. It’s so clean and the streets are wide and there are so many beautiful monuments and buildings. The river Seine runs through it and there are 36 bridges over it and such white wide ones too. The outstanding thing is the Eiffel Tower which can be seen from any point in Paris. It was quite a long train trip and rather tiresome but after we had a nice hot bath and got cleaned up we were ready to go and see the sights. The first afternoon we walked and walked for miles and took some snaps. In the evening we went to the Folies Bergere. Boy oh Boy. I never saw anything like it in my life. The scenery and costumes were marvelous. Some of the girls didn’t wear very much. A little silver girdle, a pair of slippers and a smile. Some of it was rather embarrassing and we sure were thankful we were all girls instead of with men. We walked back to our hotel which was quite a considerable distance but the moon was bright and the streets were lit up to a certain extent. Next morning we got up at 8:30 to go on a bus tour. It lasted about 3 hours and we saw all the most important spots such as Notre Dame, The Concorde, Champs Elisee, Napoleon’s Tomb, The Trocadero and ever so many other spots. In the afternoon we walked again and shopped. At night we went to a dance in the Hotel Dorsay where the ballroom is absolutely breathtaking with its glass chandeliers and bronze and gilt walls. We had a grand time. The next morning we slept in and had breakfast in bed. Sunday afternoon we walked some more and took pictures and in the evening we caught the train back. I’m still tired as I haven’t walked so much since leaving London. I’m sure going back for my 7 days leave. The snaps I’m enclosing were taken here when there was a fair on or “Mardis Gras” as they call it. One Sunday afternoon we went and tried our hand at shooting, rode on the little cars and ate potato chips. The Mardi Gras lasted for about two weeks. I imagine in peace time they really go to town and celebrate, dances, parades and much more to eat and drink. I haven’t been getting any mail for two weeks now. I wonder what’s the matter with everybody. The weather has been grand. A little rain, a little cold but lots of sunshine. In fact it feels more like April than February. The trees are getting green and the grass is like velvet already. I’ve been very busy at work. I changed my job and now I sure can’t complain of not having anything to do. The days are much too short for all the work that has to be done. However, we’re pretty well caught up now and I hope it won’t be too rushed from now on. I hope you’re all feeling fine and that the weather has improved. I’m feeling pretty good these days. Nothing to complain about but I’m sure looking forward to coming home and I hope it won’t be too long before we’re on the move toward Canada. Cheerio for this time and lots of love. Mike I rec’d another carton of Exports. Thanks a million. 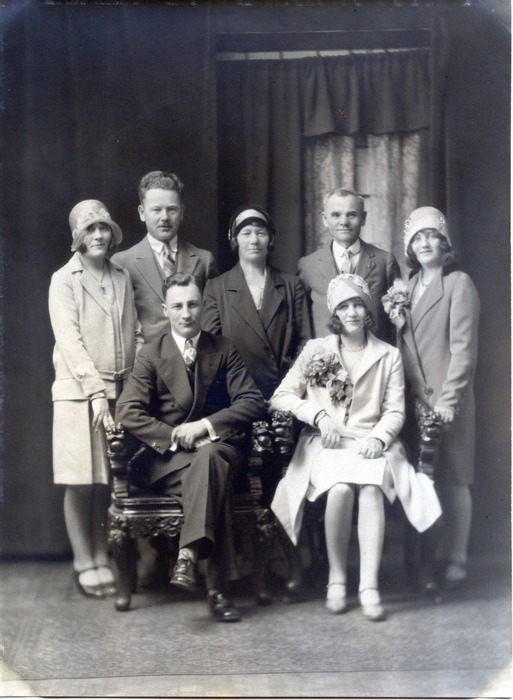 In celebration of Mother’s Day, I wanted sum up what I know about each of my great-grandmothers, none of whom I think I ever met in the flesh, although I have gotten to know them a little bit through my genealogical research. Julia (center) at her daughter’s wedding in 1929. “Swedish” wasn’t her real name. The actual spelling, as it appears on her son’s birth certificate, is Swider. This, I believe, is actually Świder, which is the name of a village near Warsaw. But she may not have come from there… according to the family legendarium, she came from the same village as her future husband, which I have determined to be Rozdziele (near Gorlice, about two hundred miles south of Świder), just north of the Slovakian border near the foot of the Carpathian Mountains, in what is now south-west Poland, though when she was born in 1884 it was in the now-defunct Kingdom of Galicia and Lodomeria, part of the Austrian Empire. According to those family legends, Julia and her future husband emigrated to North America separately in about 1899 and met by chance at a party in New York City, where they got married. Later they moved to southern Alberta’s coal belt and started a dry goods business near Lethbridge through the patronage of a friend. I haven’t been able to back up this story with any documentation, yet. I have found many Galicians in the Ellis Island passenger lists named Swider (and Bubniak, her husband’s name), but no definitive matches. The earliest firm document I have establishing Julia’s existence is the birth certificate of her first son in 1904. She and her husband were marvelously vague about their past. On the 1906 Canada census (when Julia would have been about 22), it states that she came to Canada in 1900, whereas her husband Joe arrived in 1886 (I am almost certain that Joe’s statement here is bogus, and perhaps hers is too). The 1916 Census states that they both arrived in 1898 (if this is true then she would have been only 14… which might suggest an elopement? But I have no stories hinting at that). And by 1921, they were saying that she arrived in 1903, and he arrived in 1897. So who knows? Julia’s religion at birth was probably Uniate (Greek Catholic) and her language was probably one of the Western Ukrainian dialects, possibly Lemko. She insisted that her children grow up speaking English, and only her firstborn son spoke any Ukrainian at all. She raised her children in the United Church of Canada, and she was active in the Rebekah Lodge (the female wing of the International Order of Odd Fellows, a fraternal organization with roots in Britain), rising to the rank of “Noble Grand”, the highest post at her local chapter. 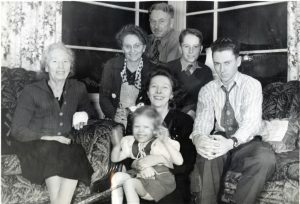 Julia (left) with her family in 1947.
sprawl but in those days was quite pastoral. 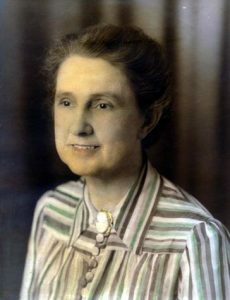 She managed the farm until her husband’s death in 1947, whereupon she moved to New Westminster to live with her son until her death in 1949. Julia rarely smiled, but here’s a photo of her smiling– this was Christmas 1947 at her daughter’s house, almost a year after her husband died. It was the first time in years when she didn’t have to do all the cooking. Lucy Scarlett: What a great name! She was born Lucy Ann Somerfield in 1867 in Bloxwich, Staffordshire, England. The fact that the earliest documents I have for her do not record a father, but show her sharing the same surname as her mother (Jane Somerfield, 1844-1914) leads me to suspect that she might have been born out of wedlock. By the time she was 4 years old, the census of 1871 claims that her mother had married one George Scarlett, a Bloxwich miner, and it appears George has adopted little Lucy, although her name is still “Somerfield”. (In fact, George and Jane did not legally get married until 1873… suggesting a little bit of drama that I have no insight into, except what I read in these old documents). In 1885 18-year-old Lucy married George Lindley Coulson, a hard-drinking coal miner. He was over 6 feet tall; she was 4 foot 10. The legends say that she was an accomplished singer and even sang “in the opera”. This may be true– there was quite an active music-hall scene in late 19th century Yorkshire, and she may well have taken part. Lucy’s children gather at her grave 50 years after her death. This life was hard on her. Sometime after 1908 her husband decided he had had enough of the United States and wanted to get back to British territory, so the family pulled up stakes again and started heading north-west, mostly on foot, across Wyoming and Montana on a vague, wandering route towards Canada, stopping periodically to work at ranches and coal mines along the way. Lucy had at least one, perhaps two, miscarriages on the trail. There was no border to speak of in those days, and they finally reached the Northwest Mounted Police outpost of Fort Walsh, Saskatchewan, in August, 1911. Lucy was already suffering from tuberculosis and pneumonia; she died almost immediately from the exhaustion of the journey, and was buried in the police cemetery there. She was only 45 years old. Lucy was remembered somewhat more fondly by her children than her husband was. Here is a photo of them in the 1960’s when they met at Fort Walsh to install a headstone for her grave. Robina Kean Woods was born in a working-class slum in Paisley, Scotland, in 1890. Her father John was a carter, or deliveryman. John’s father was also a carter, and his father had been a boiler stoker at a cloth bleaching factory. Her family on her mother’s side were shoemakers. Both sides came from Ireland, having fled to Scotland some generations previous to escape the Great Famine. Robina’s family attended the Free Church of Scotland, a fairly radical offshoot of the presbyterian Church of Scotland. She was wrenched into the episcopalian Church of England at the age of 19 when she married William Elliott, a young man who had a good engineering job at the Paisley threadmill. They hid it well, but his family was Irish too, and had left Ireland around the same time as hers and for the same reasons. I mention the Irish connection because in Scotland in those days, to be Irish– even Protestant Scotch-Irish from Ulster– was to be seen as little better than an animal. The Irish were despised and could not aspire to any but the meanest jobs. William’s family had carefully recrafted itself to be seen as Scottish, and William was the first in generations to have any job but unskilled labor. Robina probably thought she was moving up in the world, by marrying him. They started a family and things seemed to be going well for Robina; her husband’s employer even gave them a nice house to live in in a respectable neighborhood. The First World War changed things, and William’s wartime injuries forced him to seek employment elsewhere. They had to move out of the company house. He became a gamekeeper and had a series of jobs all over the Scottish highlands; Robina, as the gamekeeper’s wife, not only had to keep her own household but also function as a domestic servant at the great estates where they resided. She had seven children during that time; the family finally emigrated to Canada in 1927. Neither her family nor her husband’s had any background in farming, but suddenly Robina found herself a farmer’s wife in a foreign country with unbelievable temperature extremes and prodigious snowfall. They managed to keep up that life for 9 years, having two more children in that time. Despite all the children they had their differences, and they separated after they retired to Calgary in 1936. Then Robina worked energetically as the manager/caretaker for an apartment building; she outlived William by 14 years and died in 1963. 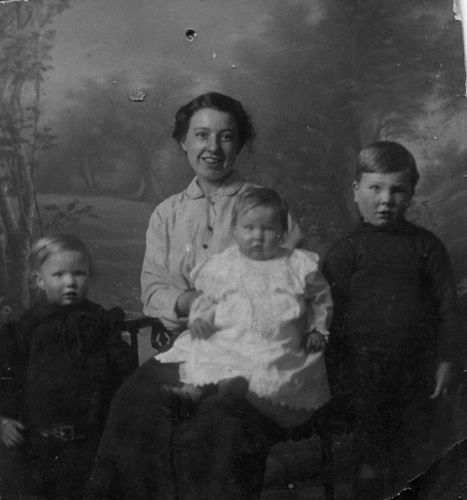 Cora was the only child of a farming couple in Ontario. Cora’s family on both sides were solid Upper Canada farming folks. I have been able to trace them back to the American Colonies in the 18th Century, which they probably left as a consequence of the American Revolution; possibly they were part of the Tory exodus to British North America. Cora herself was born in Norfolk County, Ontario in 1887. 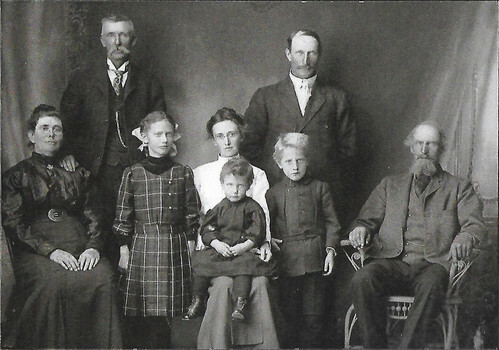 She moved with her parents to Olds, Alberta in 1900 when she was about 13, and married John Luska Berkley, a farmer of German descent, in 1904. She had five children. I know little about her except what I have learned from cousins who had contact with her. She and her husband farmed the same land for 40 years. Their house burned down in the winter of 1935; the community pitched in to help them rebuild. They passed the land on to one of their sons when they retired in 1946; then she lived on in Olds until her death in 1961. She was, I’m told, an excellent seamstress. OLDS GAZETTE: November 24, 1938: the home of Mr. and Mrs. J. L. Berkley was the scene of a memorable event on Wednesday evening last, when about twenty-five intimate friends and relatives joined with Mr. and Mrs. Berkley in celebrating their 34th wedding anniversary. Preparations had been carried on while Mr. Berkley was away so the whole event was a complete surprise. During the dinner hour (6:30) Mr. Fred Penny proposed a toast to the honored couple, speaking warmly of the friendships which had strengthened during the years. Mr. Berkley replied fittingly. The scene was most effective and will live long in the memory of those present. Mr. and Mrs. Berkley were married November 16th, 1904 at the home of the bride’s parents, Mr. and Mrs. A. Foss, when their home was the present Charlie Bowman farm. Rev. Lang was the officiating minister. The day was bright and warm with no signs of snow. Those from a distance attending the anniversary dinner were, Mr. and Mrs. Foss, Olds, Mr. and Mrs. W. Miller, Didsbury, and Mr. and Mrs. W. Golden of Sundre. (Credit for the above goes to Janis Berkley’s History of the Berkley, Foss, and Connon Families). Mary Theresa Griffin (other surnames are Davis, Paul, Nelson, and Coulson) is someone nobody within my immediate family network even knew existed, until I started my genealogical digging. She’s what you might call my step-great-grandmother. She’s the second wife of George Lindley Coulson, and therefore not in my direct genetic line, but the more I discover about her the more remarkable I find her. After Lucy Scarlett died at Fort Walsh in 1911 and her (mostly-adult) children scattered to the winds, her husband George wandered back into the U.S.A. and found himself in Havre, Montana in 1915. There he married Mary Griffin, and they proceeded to spend the better part of 25 years together. Who was she? Mary was Métis, born into the family of Oliver Paul in 1862. She was baptized in St. François Xavier, a village that lies a bit west of the present city of Winnipeg; at that time it was part of a network of communities known as the Red River Settlement, semi-itinerant groups of fur trappers and buffalo hunters in Rupert’s Land, a vast area that had been owned and worked as a monopoly by the Hudson’s Bay Company for two centuries. In a few years title to this land would be transferred to the nascent Canadian government, leading directly to the Red River Rebellion of 1869, followed by the North-West Rebellion of 1885. Mary fits into this history, somehow, I’m sure. She acquired the surname “Davis” quite early, and in 1879 (when she is just 17) we find her at Fort Assinniboine, Montana. There she met a Scottish immigrant named Jack Griffin who had a government contract hauling firewood to the fort. She became his common-law wife and bore him at least 12 children over the course of 24 years; they finally became formally married in Havre in 1903. Mary, it seems, was Jack’s lover, wife, agent, and manager. She took care of Jack’s ranch, raised his children, and fed his employees. 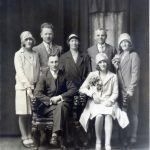 These are details that I have gleaned– perhaps imperfectly– by poring over census records, as well as the birth, death, and marriage records of Mary and Jack’s children. Jack died in 1913. Mary held an estate sale and sold off all the ranch livestock and equipment. In 1915 she hooked up with my great-grandfather George and in 1917 they moved to Canada. George declared $4,750 in cash and effects to the border officials; I have little doubt that this was Mary’s money. George wasn’t much of a saver. 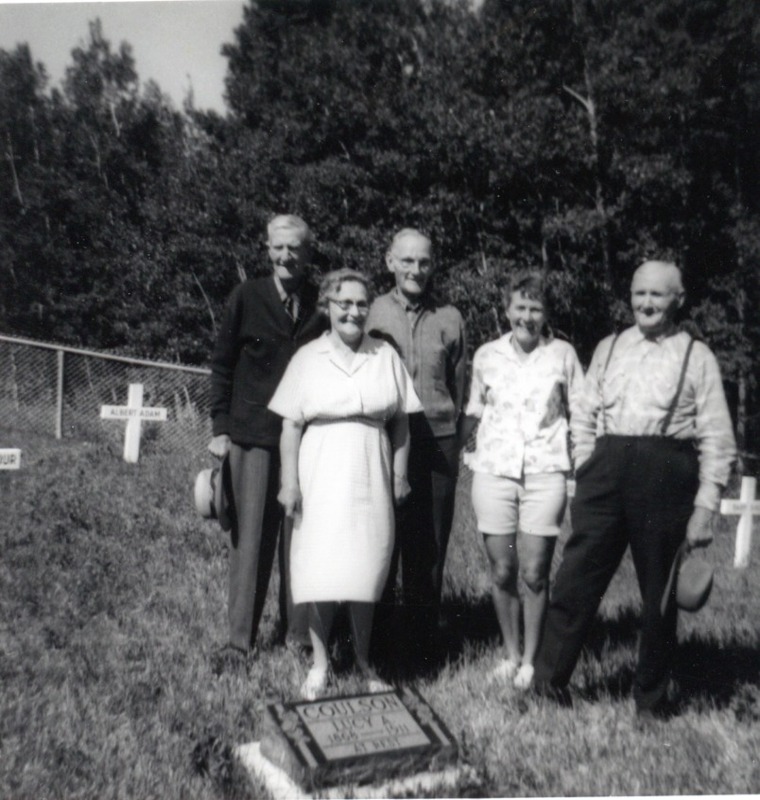 Mary and George settled in Plamondon, Alberta (near Lac La Biche), and farmed there for almost 25 years, about as long as Mary had been with Jack. I think they chose Plamondon because Mary probably had relatives there: that region had been a welcoming refuge for Métis fleeing the brutal suppression of the Red River fights for independence in 1869 and 1885. I suspect they were not very successful at farming; they probably lived off of Mary’s money and wound up quite poor towards the end. 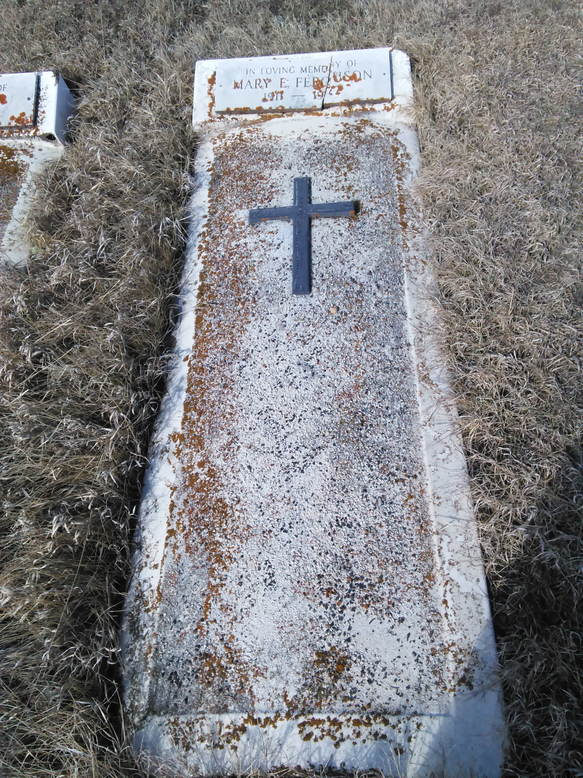 Mary died in 1938 and was buried in Edmonton in an unmarked grave (and George, who died two years later, also has an unmarked pauper’s grave in a municipal cemetery). Mary’s funeral, though, was well attended and some of her children came up from Montana to say farewell. Violet is another step-great-grandmother. She entered my family tree after my grandparents got divorced in 1946, thus introducing a whole new vast network of ancestors to track down. Violet Elizabeth Clegg was born in a suburb of London in 1886 to a large family– she had four brothers and three sisters. Her father Samuel was in the insurance business, and her mother Elizabeth was “a prominent political and social worker and was also a popular figure on the concert platform” (this from Samuel’s obituary). In 1909 Violet married a young man named Henry Giles, who may have been an employee or junior associate of her father. After giving her two daughters he went off to the War and was killed in action on the Western Front in 1917. I found it rather fascinating that Violet’s brothers were commissioned officers during the War, but Henry was not. I wonder what, if any, family tension that may have occasioned? After the War Violet remarried, this time to a charming man named Alfred Willis, who became the perfect father to Violet’s two daughters. They regarded him with great fondness. After Violet’s daughter married my grandfather following World War Two, I don’t know much about her except a few photos. She looks like a content woman who enjoyed taking vacations with her husband, and I can see she loves dogs. She came over to Canada a few times to visit (I’m told I may have met her, though I don’t remember), and she died in 1971. You can read more about Violet’s interesting family over on Neil Berrett’s blog. I like to play the game of how it would be to bring them all together at a Mother’s Day brunch, perhaps. It would have to be prior to 1911 when Lucy died… Let’s say 1910, when Lucy is 44? Julia is 26, Robina is 20, Cora is 23, Mary (the eldest) is 48, and Violet is 24. They were such vastly different women… I wonder how it all plays out. 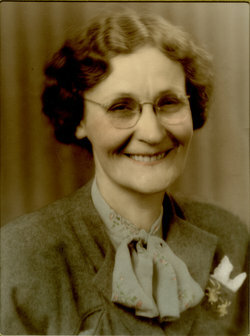 Aunty Mary, who died over 30 years ago, is the primary source for much of my earliest Coulson family history. She was born in Wyoming but she must have spent a lot of time listening to her folks, because she knew quite a lot about her grandparents and great-grandparents back in Yorkshire. It gives me great pleasure to track down her stories and see how true they are. I’ve become Aunty Mary’s posthumous fact-checker. She knew a lot about her father’s mother, Mary Coulson. 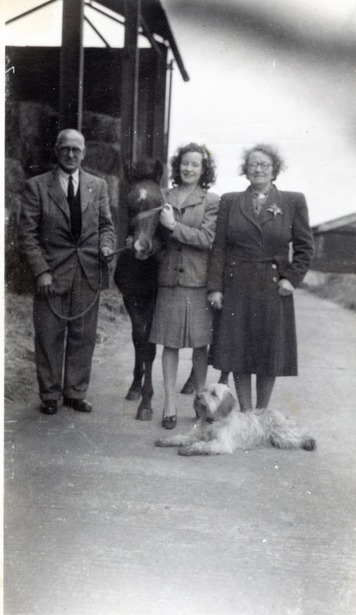 According to Aunty Mary, her grandmother Mary’s first two children– George Lindley Coulson and Emily Ann Coulson– were born out of wedlock to Mary and a man named Jim Barlow. But instead of marrying Barlow she went and married Tom Henson. By that time, though, George and Emily had already been adopted by their maternal grandfather, William Coulson (who later clobbered a man with a shovel and ran off to Australia) and that is why my great-grandfather George was surnamed Coulson, not Barlow or Henson. It would be nice to try to validate some of these facts, wouldn’t it? Emily and George were both baptized on May 5, 1867. I have found other documents showing that Emily was in fact born in December 1866, and that George was born on December 10, 1864. I can’t imagine why Mary took so long getting George baptized, but the thing I wanted to point out about the baptismal register is that only Mary’s name appears; there is no father. 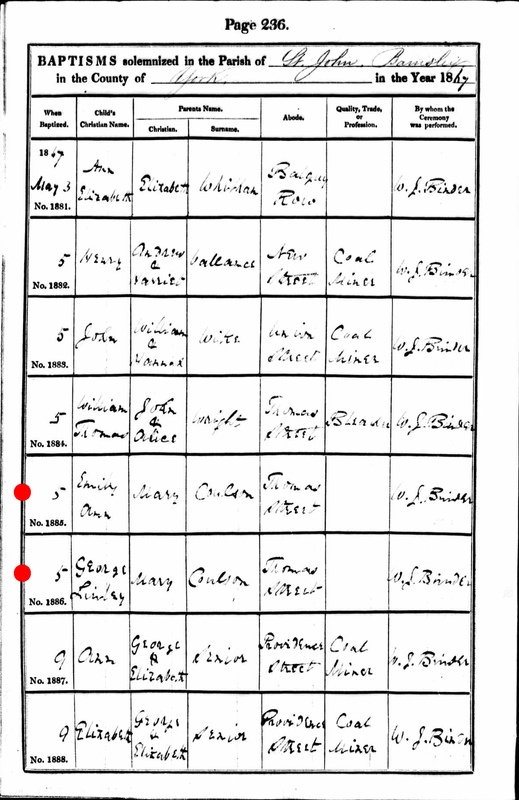 Later I found the marriage registration for Mary Coulson and Tom Henson– they were married later that same year, 1867. 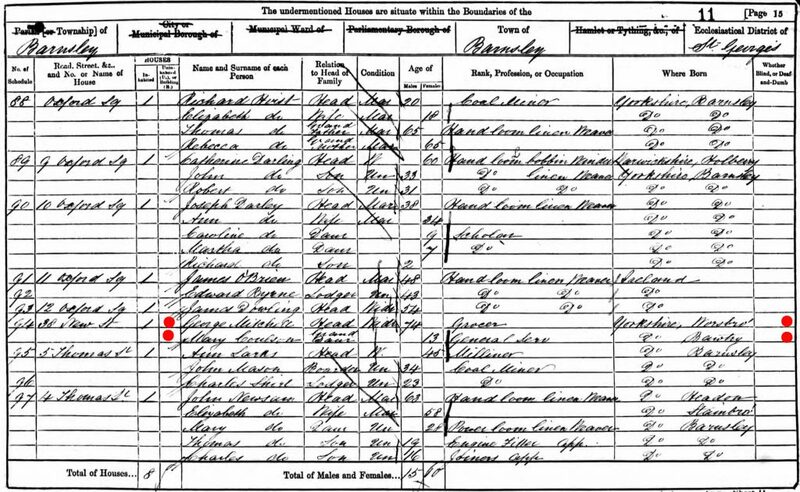 By the time of the 1871 Census, Mary, Tom, George, and Emily are one big happy family… but note that 6-year-old George is still a Coulson (or here, “Colson”). Apparently Tom hasn’t adopted him yet (and, for some reason, he never will… which is why we’re named Coulson, not Henson). Also note that Tom, Mary, and the children are living as lodgers in the home of John Black, a musician… There’s another one of Aunty Mary’s stories lying in plain sight there, but that’ll have to wait for another day. Well, we have accounted for Tom Henson. So far, Aunty Mary’s story checks out. What happens if we go looking in the opposite direction? In 1861, I found a 13-year-old Mary Coulson living with her 74-year-old grandfather, George Mitchell, a grocer. Mary’s occupation is “General Servant”. Their address is 38 New Street in Barnsley, Yorkshire. I can’t be 100% certain that this is my great-great-grandmother because “Mitchell” is a name I never heard about from Aunty Mary, and I never heard of Mary living with her grandfather. However, this girl’s parents are obviously absent, and that fits with Aunty Mary’s story of Mary’s father running off to Australia. Plus, this Mary’s age is exactly 10 years younger than the young woman in the 1871 Census, and the birthplace of the two Marys (Bawtry, Yorkshire) is a match, too. And, of course, her name lines up with what I think I know. Here we have a 16-year-old “Tinner & Brazier Apprentice” named James Barlow, living with his parents, Edwin and Rebecca, and several brothers and sisters. Hm, that’s interesting. Didn’t Aunty Mary say that Jim Barlow was the father of Mary’s first two children? 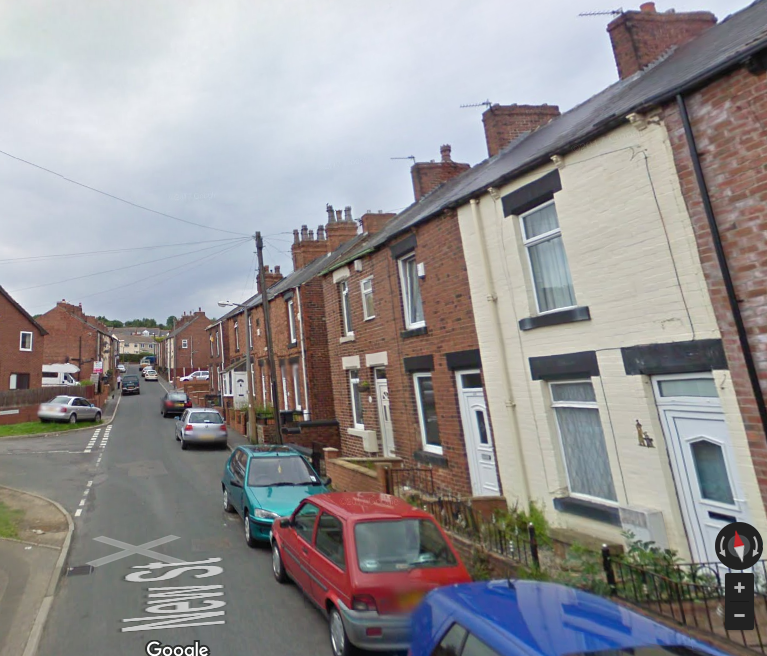 Check out James Barlow’s address: 74 New Street, Barnsley, Yorkshire. James and Mary were practically neighbors. Mary’s house is the white one on the right. James’ house is a little before the end of the street, also on the right. Obviously this is highly conjectural. I have no documentation regarding the true parentage of George Lindley Coulson and his sister Emily. 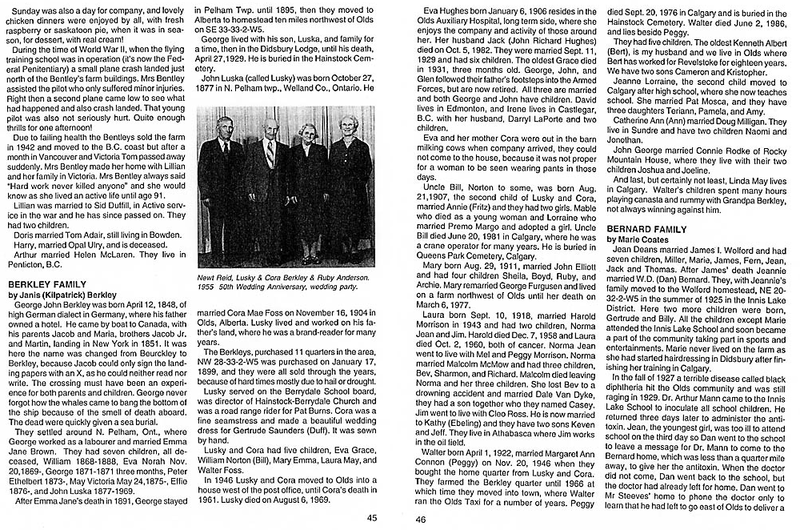 I have no reason to link the census page recording Edwin Barlow’s family with the one recording George Mitchell and his grand-daughter. All I have is the word of Aunty Mary, who has been dead for a third of a century. Well, that’s good enough for me. I think James and Mary met in the course of their young working-class lives on the streets of Barnsley. Mary’s grandfather being a grocer, perhaps the Barlows were customers of his. Mary was only 13 in 1861, but by the time her son George was born she would have been 16, and James would have been 19. A perfect age to start a family. 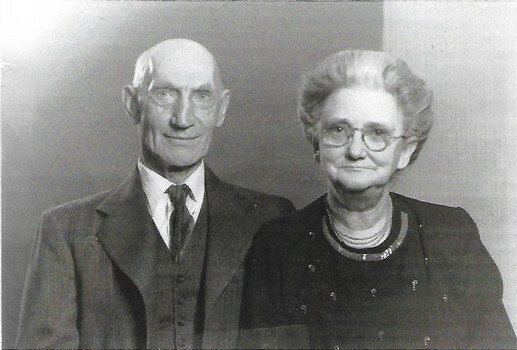 But for some reason things didn’t work out for them, and they didn’t get married… I have traced James through the United Kingdom censuses up into the early part of the 20th century, and I know that he eventually married a woman named Angelica and had many children by her. 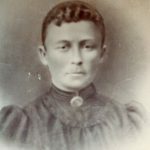 Mary, as we have seen, went on to marry Tom Henson and the whole family– including George Lindley, Emily, and Tom and Mary’s own natural children– all emigrated to North America around 1888. Funny how a tiny scrap of scurrilous family gossip can lead you to an important find. Without these stories I would have no clue about the true identity of my great-great-grandfather Jim Barlow. I can’t speculate much on the relationship between Mary, Jim, and Tom, but what I can say is that Aunty Mary’s facts are checking out. When I was driving through Havre, Montana a while back I decided to stop at the public library to see if they had any books on local history. I wanted to investigate a story I had heard that my grandfather’s sister, my notorious Aunty Mary, had worked at a hotel there as a girl. It turns out the library does have quite a rich section dedicated to local history and genealogy which I could have spent days perusing. I didn’t discover anything about Aunty Mary’s hotel but one thing I did make note of before the library closed was an ancient dusty set of books containing Montana marriage registrations going back to the start of the 20th century. I wished I could have taken it home with me because I had a feeling it would come in handy someday. Fortunately there was no need to walk off with it. 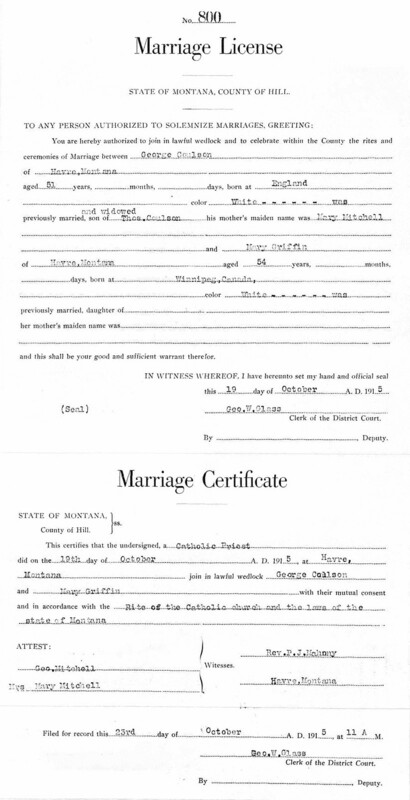 The reason such valuable old records are lying out in the open is that they were digitized and indexed long ago by the Mormons and they are now available as the Montana, County Marriages, 1865-1993 database on FamilySearch.org. Searching through those marriage registrations, as well as census records from those days, has taken my research to a new level. Another resource I’m putting to good use is the free collection of old newspapers hosted by the Library of Congress. During the early eighties Mr. Griffin came to Fort Assinniboine and had the contract for hauling wood to the post for some time. About 1888 or 1889 he settled on a ranch in the Bear Paw mountains, about 25 miles south of Havre, where he has since resided. As the years rolled by he increased his land holdings and stock interests until at this time he has over two thousand acres of the finest land along the Clear Creek valley, besides hundreds of head of cattle and horses. In the 1910 Census I found Jack Griffin’s family living in Clear Creek as the obituary states. His wife, Mary T. Griffin, is identified as French Canadian, born about 1862 in Canada. I used the list of children in the household (the eldest being Nathaniel, born about 1886) to trace the family back to the 1900 Census. There the head of the household is identified as Mary T. Davis, born in Canada in 1862. This has to be the same Mary T. as is in the 1910 Census. All the children are surnamed Griffin and it says they had been married 20 years; it seems Mary and Jack must have had a common-law marriage. Sure enough, I found their actual marriage registration in that database comprising the marriage registers I saw in the Havre library. In 1902, after more than 20 years of living as man and wife, John C. Griffin married Mrs. M. T. Davis, previously married and divorced. Her maiden name was Paul and she was born in Manitoba, Canada. Her race is listed as “Half-breed”, which is what they were calling the Métis back then. The census says that Mary T. immigrated to the U.S. in 1879 (aged 17). It says Jack immigrated in 1866 (aged 16). I wonder whether any of the children belonged to Mary’s first marriage with this Davis fellow. 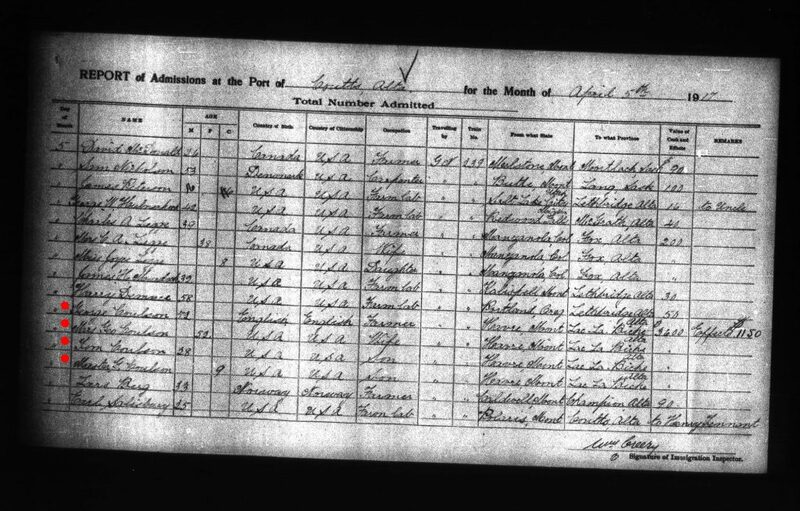 If we take the statements on the census at face value then I suspect Mary left her first husband Mr. Davis in Manitoba in 1879 and headed south, meeting Jack when he was hauling wood to Fort Assinniboine in 1880; that is the year of the birth of her first (known) daughter, Betsy. It’s hard to say since Mary and Jack weren’t actually married until 1902 and her first marriage didn’t leave a paper trail that I have found. A news item from Havre reports the escape of Nat Griffin from the Hill county jail. The prisoner was being held for trial on a charge of cruelty to animals at Box Elder, and conviction would have given him a term in the penitentiary. Old Bear Paw Jack died the following year (September 1913, as we have seen). Then I found, again in those Montana marriage registers, Mary T. Griffin of Havre marrying one Martin Nelson, a 53-year-old Norwegian immigrant. After that I lose track of Mary and Martin Nelson. Nathaniel pops up in the Montana State Penitentiary records in 1916, when he was sentenced to 2-8 years for Grand Larceny. In September 1918 Nathaniel, despite being in prison, had to register for the Draft, since the U.S. Army was desperate for recruits and had to start reaching pretty low to satisfy The Great War’s unquenchable thirst for human life. Mercifully Germany and Austria were collapsing at that point and the war was over two months later, so it doesn’t look like Nathaniel got to see action. Interesting stuff, but this is not a story about Bear Paw Jack or his wayward son. Those people are not in my family tree at all. No, this is a story about the identity of my great-grandfather’s second wife. Let’s back up a bit. 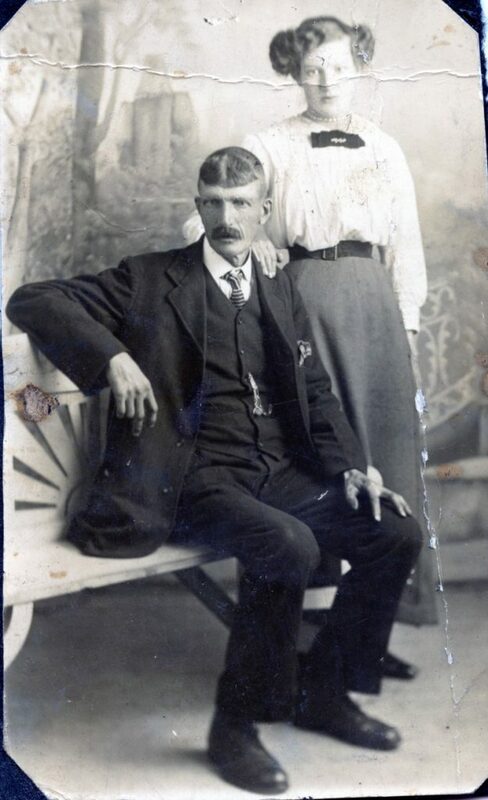 My great-grandfather George Lindley Coulson was born in 1864 and grew up in the coal mines of Yorkshire. He married Lucy Ann Scarlett, a tiny but tough woman from Staffordshire. The story of their epic journey from England to Pittsburgh to Wyoming and finally to Saskatchewan will have to be told another day. They stopped for a while in Havre, Montana, and that’s where their daughter (my Aunty Mary) stayed to work in the hotel. The rest of the family continued on, crossing the extremely porous U.S.-Canada border in the summer of 1911 (on foot, walking alongside their livestock). Almost as soon as they arrived at Fort Walsh, Saskatchewan, Lucy, aged 44, dropped dead from tuberculosis and pneumonia. She had had two miscarriages along the way, and she was exhausted. 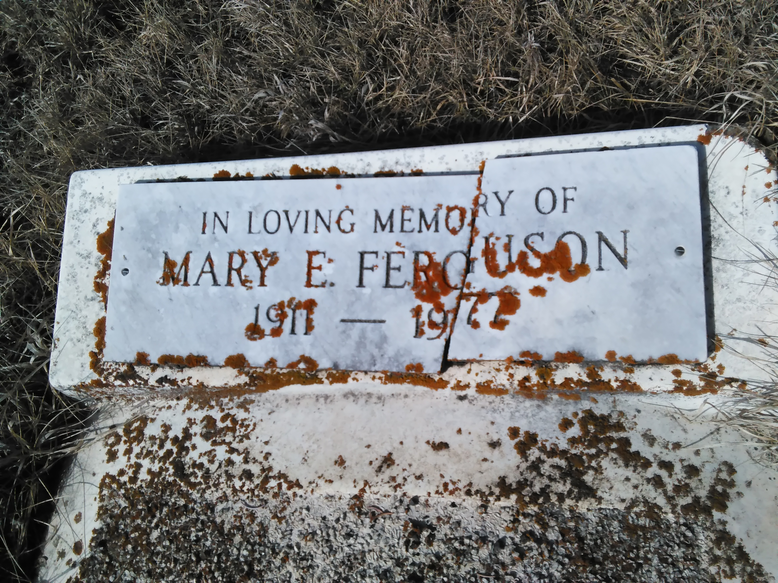 She lies buried in the Northwest Mounted Police cemetery at Fort Walsh, one of the few civilian graves to have a real headstone. She was highly esteemed by all her children. Fifteen-year-old Aunty Mary had to come racing up from Havre in her employer’s buckboard to take charge of the family, since George Lindley, having gone to Maple Creek to buy a casket for his dead wife, wound up spending the money on a drinking binge while his wife’s body lay back at the Fort ripening beneath the hot August sun. The family kind of fell apart after that, and discovering what happened next has been one of my enduring genealogical quests. My grandfather was only 6 years old at the time of his mother’s death and his recollections don’t really begin until the Influenza Epidemic of 1919. I did find something that gives me a clue, though: a Canadian immigration record from April 5, 1917 at the border crossing at Coutts, Alberta. That’s definitely my great-grandfather George Lindley Coulson, en route from Havre, Montana, to Lac La Biche, Alberta. Accompanying him are his sons Tom (my Uncle Tom, who later settled in Edmonton and had a big family there) and 9-year-old “Master G.” (that would have to be my grandfather, George Arthur). Also there is “Mrs. Geo. Coulson”. This is immensely interesting. It seems that after dragging his family to Saskatchewan in 1911, George Lindley eventually drifted back to Havre and got married again. Then he moved to Lac La Biche in 1917. And boy, was he rich! He was carrying $3,600 in cash and $1,150 in “effects”. It looks like he was the richest man on Train #239. Knowing what I know about him I have a feeling he didn’t earn that money himself. I think it must have belonged to this mysterious second wife. My grandfather never mentioned any of this. I know that George Lindley had a second wife, and all I know about her comes from my grandfather’s recollections of growing up on his father’s farm near Plamondon, a hamlet about 20 miles from Lac La Biche. I know that my grandfather hated his step-mother, and she didn’t like him either; he was chucked off the farm when he was 16 and went to live with his sister in Saskatchewan. He didn’t see his father again for almost 20 years after that, and he certainly never saw his step-mother again; he couldn’t even remember her name. Lac La Biche, interestingly, has an ancient association with Canada’s fur trade and it played a role in the Northwest Rebellion of 1885. It was a center of Métis culture long before the colonization of the Canadian prairies and it had strong ties to the Red River settlement in Manitoba. This is actually a clue in our story which I’ll return to later. So then I went hunting for the elusive “Mrs. Geo. Coulson” and I soon found her amongst the death registrations in the Alberta Archives. 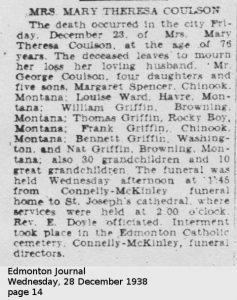 Her name was Mary Theresa and she died on December 23, 1938, in Edmonton. She was born August 19, 1862 in Winnipeg, Manitoba. Her racial origin is listed as French and her nationality Canadian. Religion, Roman Catholic. My great-grandfather signed the certificate, meaning that all this information came from him. She died in the old Misericordia Hospital, which, coincidentally, was the hospital where I would be born many years later. But here, I at last had a name! Mary Theresa Coulson. Not a maiden name, but it was a start. I used the index of graves at the Alberta Genealogical Society to track her down in St. Joachim’s Catholic Cemetery in downtown Edmonton. I visited the grave site but it’s just a patch of grass. I fear that George Lindley was so poor by 1938 that he didn’t have enough money for a headstone. 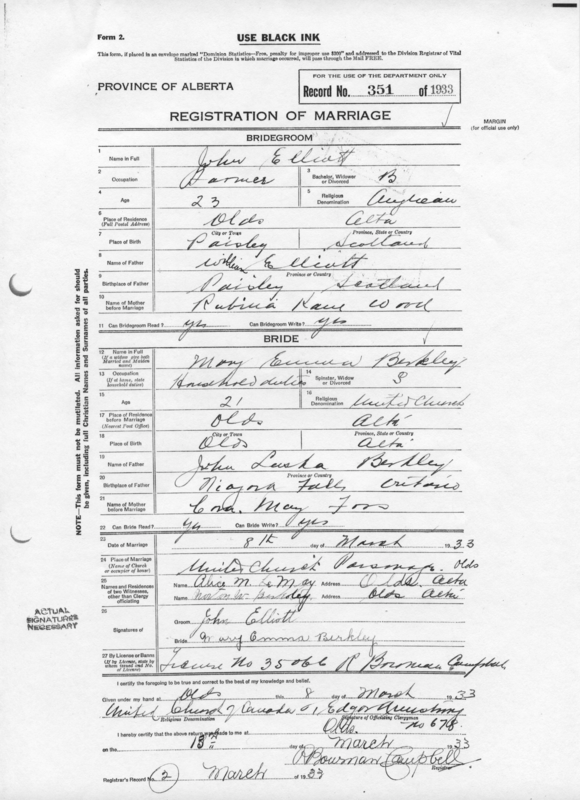 Getting back to the Montana marriage registers, I found the record of George and Mary’s marriage in 1915. Or at least, I think I did. It’s a little confusing. On October 19, 1915, a George Coulson married a Mary Griffin. Is this the George and Mary I’m looking for? Well, it was a Catholic wedding, which fits our bride. Mary was born in Winnipeg, which also fits. The ages of the bride and groom are a perfect match. But there are two extremely odd things to note: first, the fields for Mary’s parents are blank. Second, the parents listed for George absolutely do not line up with what I know (or think I know). George (according to Aunty Mary’s tales) was the illegitimate son of Mary Coulson and James Barlow, and he only bears the surname Coulson because he was adopted by Mary’s father in order to spare the family disgrace. When this Mary Coulson eventually did get married it was to a man named Henson, not Mitchell. I have got no idea who this “Thos. Coulson” and “Mary Mitchell” are. This might constitute new information for my family tree, or it may be completely spurious. I questioned the validity of this marriage registration for a long time. Mary Griffin’s marriage to Martin Nelson in May 1914 was another real problem for my timeline, because just 18 months later Mary Griffin married George Coulson. Was this the same Mary Griffin? If Martin had died, I should be able to find a death record for him… Why can’t I? Was this George Coulson my great-grandfather, or some other George? If it’s the same Mary and George, why all the missing and incorrect information on the marriage documents? Did they have something to hide? And that’s where things sat for quite a while. 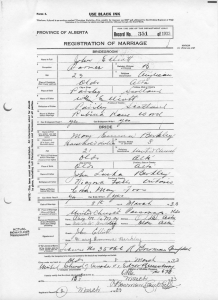 I was unwilling accept “Griffin” as the surname of my grandfather’s step-mother because this incomplete marriage registration was the sole evidence I had, and it was too shaky. There could have been more than one Mary Griffin in Havre in those days, right? And George Lindley might have gotten married someplace else and I just haven’t found it yet. That’s when my casual research into Bear Paw Jack Griffin blew the case wide open. Could Jack’s wife Mary T. Griffin, born in Winnipeg in 1862, be the same as Mary Theresa Coulson, also born in Winnipeg in 1862? You will remember that Jack’s son Nathaniel had to register for the Draft. His draft card holds the key to this mystery, because on it he identified his mother. Nat identifies his nearest relative as “Mrs. George Carlson, Plamondon, Canada”. That, without a doubt, is Mary Theresa, whose unmarked grave I found in Edmonton. It’s identical in every respect, except the next-of-kin’s name is changed to “Mrs. George Coulson”. At least it might be Coulson; the third letter in the name is a little squiggly. One can picture Nat trying to remember the name of his mother’s latest husband… was it Carlson? Coulson? How did she spell that? The draft board official did his best to take down both names. 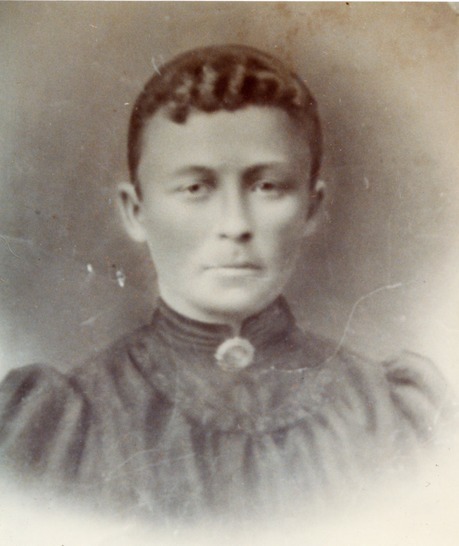 Mary Theresa Paul, daughter of Oliver Paul, was born in the Red River settlement in 1862 when Rupert’s Land was still claimed by the Hudson’s Bay Company, 11 years before the incorporation of Winnipeg. She had a brief marriage that ended around 1879 and she left for (or perhaps fled to) Fort Assinniboine, Montana, which would later become a focal point for the Cree and Métis people fleeing persecution in Canada in the wake of the Northwest Rebellion of 1885. There she met John C. Griffin and became his common-law wife, and together they had a large family and she managed his ranch in the Bear Paw Mountains. They finally got married, and when John C. died in 1913 I would have to guess she inherited his land and was a wealthy woman. She then married Martin Nelson, the Norwegian, and I don’t know what happened to him. Then in quick succession she married my great-grandfather George Lindley Coulson. They decided to move to Plamondon, Alberta, because she would probably have had family connections there via her Métis roots and George was, after all, still a British Subject. This is probably not the final word on this adventure. I feel encouraged to learn a little more about Métis history than what we were taught in Canadian history class, because now I seem to have a fleeting family connection to it. I’d also like to get confirmation of poor Martin’s fate. And, I wonder what happened to all that money? One of the exciting things about airing your family secrets in public is that you never know who you’ll meet. Since posting this story a couple of days ago a fellow-researcher I met on Find-A-Grave was intrigued by the mystery so she picked up the torch and went searching in the Montana newspapers for clues. 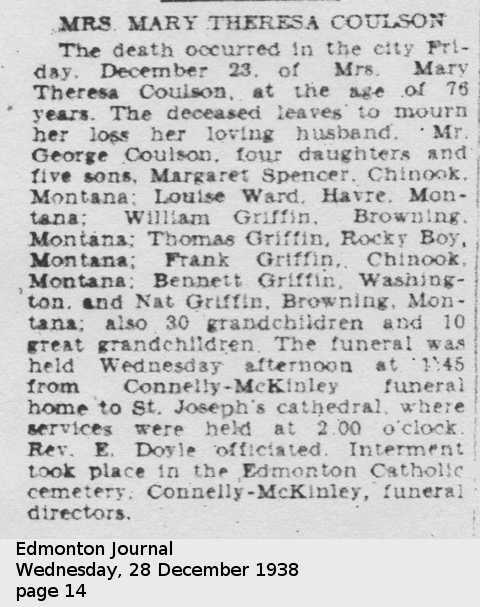 She came up with a clipping that proves definitively that Bear Paw Jack’s wife Mary T. Griffin was none other than my great-grandfather’s second wife who moved up to Alberta and died in Edmonton. The children’s names– Margaret, Thomas, Frank, Bennett, and Nat– match the ones I already know from the census records. 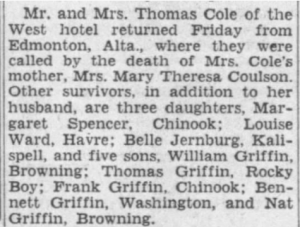 Mr. and Mrs. Thomas Cole of the West hotel returned Friday from Edmonton, Alta., where they were called by the death of Mrs. Cole’s mother, Mrs. Mary Theresa Coulson. 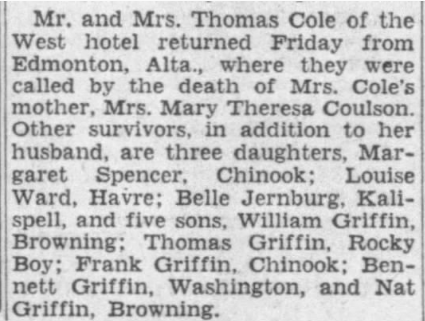 Other survivors, in addition to her husband, are three daughters, Margaret Spencer, Chinook; Louise Ward, Havre; Belle Jernberg, Kalispell, and five sons, William Griffin, Browning; Thomas Griffin, Rocky Boy; Frank Griffin, Chinook; Bennett Griffin, Washington, and Nat Griffin, Browning. Here’s to serendipity and chance meetings on the Internet. I never knew my grandmother. As far as I know she never knew me, or even knew I existed. I knew her name, but that was all. After she and my grandfather got divorced it’s as if she fell off the face of the earth. My mother refused to talk about her. When my grandfather wrote his memoirs, he didn’t even mention her name. That sounds like a good entry-level genealogical project, doesn’t it? Finding your own grandmother. OK then, let’s get started. First there are the clues in my grandfather’s memoir, in which he states that he got married in 1932. Later in the memoir he talks about adventures he had with his “wife” in London during World War Two. This is clearly not the woman he claims to have married earlier, but he never says anything about how the transition from Wife #1 to Wife #2 came about. Rather confusing. From my mother, I at least got a name: Mary Emma Berkley. She also gave me to understand that my grandfather had divorced her during or after the War. (Details were not forthcoming, but I was given to believe that he was the injured party). I got the names of Mary Emma’s parents, and where they had lived, but beyond that my mother clammed up tight. She claimed to not even know the date of Mary Emma’s death. She thought it might have been before I was born. She had no contact with her mother after the divorce, apparently. I tried asking my father, but he had never met her and all he could say was that he never heard anything about her, either. He did remember one episode, shortly after he and my mother were married, though… He recalled my mother going to a funeral in Olds, and he thinks it might have been her mother’s. He remembers hearing that when my mother walked into the funeral home everyone was startled, she looked so much like the deceased it was as if she were standing there amongst them! Because of what I knew about my parents’ movements and residences before I was born I had to place that incident in 1961. So at least I had a tentative date, and I put a lot of weight in it. I think I may have asked my mother about that funeral once, and she said she didn’t remember. Whoever submitted this data certainly knew about my grandmother, since her parents match what I already knew. But it says that Mary Emma was born on August 29, 1911 and died on March 6, 1977. It gives no documentary source for those dates, and it has no information about her husband (my grandfather) or her children (my mother and her siblings). I took this information with a big grain of salt, especially because it contradicted the death year that I thought was correct, 1961. I thought it must be a mistake. Since online research was a dead end I decided I needed to visit the Alberta Provincial Archives in Edmonton to get answers. What I discovered there blew the lid off everything I had previously thought about my grandmother. This gave me pause, because it contradicts my grandfather’s marriage year as stated in his memoir (1931). I also have a handwritten family tree of his in the notes that I inherited from him, where he states he was married in 1932. Wrong on both counts: he and Mary Emma were married on March 8, 1933. Why would he mis-state his year of marriage? Didn’t he remember it? I’ll return to that in a moment. My next discovery in the Archives was the decree nisi from my grandparents’ divorce proceedings, which contained a summary of the evidence presented at the trial and believe me, it’s a page-turner. I won’t get into details but it must have caused quite a family scandal back in the day (I’m starting to understand why nobody wanted to talk about any of this). Suffice it to say that it was Mary Emma who sued John for divorce (not the other way around), and in my humble opinion she was right to do so. The divorce was final in March of 1946. I made those discoveries within the first hour or two of my initial visit to the Archives, and they knocked the wind out of me. As I was wandering around the place trying to get a sense of what other resources were available, a kindly researcher from the Alberta Genealogical Society noticed my wandering and asked if there was anything she could help me find. I described what I was looking for, and she led me straight to a row of bookshelves that contained the Local and Alberta Histories collection, a large set of books containing family and community histories, written by the locals themselves. There I quickly found the book that pertained to Hainstock, Alberta, a farming district near Olds that I had passing familiarity with because I knew that was where my great-grandfather received a homestead when he immigrated from Scotland in 1927. 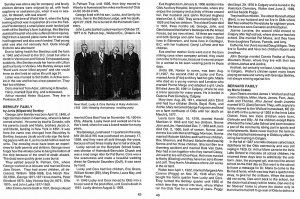 In those pages, in black and white, I found an article all about my long-lost grandmother and her family. Glimpses of the Past (Bowden, Alberta: Hainstock Centennial History Book Association, 1994), pp.45-46. This confirmed the dates in the Pedigree Resource File, and gave me a wealth of information about the Berkleys that I had had no clue of. Apparently my supposition that she died in 1961 was incorrect. 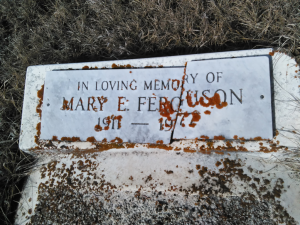 It also told me she had been married to someone named Furguson (or Ferguson) before she died. Just who was this Janis Berkley, and how did she know so much about my grandmother? Part of the reason for my trip to Alberta, apart from researching at the Archives, was attending the funeral of my grandfather’s sister-in-law in Olds. I scarcely knew Aunt Esther but since she was almost the last survivor of my grandfather’s generation of siblings and their spouses, I considered it important to go. I might also meet cousins I never knew I had who might be able to give me more information about the things I was researching. I also planned to use the opportunity to look up Janis Berkley, whoever she was, and interrogate her about my grandmother. Well, there she was. And beside her with an identical headstone was her second husband George, who died the year after she did. I suppose in a perfect world he would have been my step-grandfather. I said hello. Aunt Esther’s funeral was a success, from the perspective of my personal data-gathering goals. I learned from my cousins why my grandfather had fudged his marriage date– it was to hide the fact that his first child had been conceived out of wedlock, which was a big deal in his mind, although probably a lot more common than he was prepared to admit. I also hung around outside the Olds Museum until it opened and talked to the archivist there. Wouldn’t you know, he did know Janis Berkley. She had moved down East but he promised to pass my email address on to her. I waited against hope for a couple of weeks, and was delighted when she contacted me. She knows so much because she is married to one of Mary Emma’s nephews, and she took on the role of family historian back when the old timers were still alive and able to talk to us. I’m coming late to that game but fortunately Janis was more than willing to give me all the information I could handle, not only about my grandmother but about her siblings and their families. I was happy to reciprocate with information of my own, since they knew very little about us too. I’m glad I was able to rehabilitate my grandmother’s memory and get to know her a little bit, so long after her death. It’s too bad this research came too late for my mother, who died before I embarked on this project and was never able to reconcile herself to her mother’s memory. Here’s the best picture I have been able to find of Mary Emma. It came, surprisingly, from my grandfather’s collection. My best guess for dating this photo is August 1940, just before the Calgary Highlanders departed Camp Shilo en route to the War, when my grandfather had a few days leave to return home to say goodbye to his wife. This portrait paints quite the lovely picture of a happy family, and while I now know their marriage was pretty much on the rocks at this point, perhaps this is the best way to remember them. A few people have asked me, publicly and privately, whatever happened to Mary Emma. Eventually she married a man who was able to care for her more than my grandfather could. This was George Ferguson, and since he was Roman Catholic he had to wait a number of years before he could get a dispensation to marry (her being a divorced Protestant and all). They had no children, and lived out the remainder of their lives in relative seclusion on George’s farm, quite uneventfully it seems. Meanwhile my grandfather poisoned his children’s minds against their mother. He rewrote the story so many times in his own mind that he started forgetting the details. But since he had literary aspirations, and since he was an officer of the Crown and a Freemason and a pillar of the community, his side of the story endured. Mary Emma’s just sank quietly into the earth. In The Irish Connection, Part 1 we learned that my presumably Scottish family had its origins in Ireland. There’s more to the story, though. To help keep things straight, here’s the family tree so far. A is “young” John, the Scotophile who discovered he may have Irish roots. B is “old” John, young John’s grandfather, whom we learned in Part 1 was indeed born in Ireland (most likely in County Fermanagh, in the vicinity of Irvinestown), and emigrated to Paisley, Scotland before he was 5. John Elliott (1859-1915) and his daughter Mary Andrews (Elliott) (1895-1981). This photo of “old” John is undated, but I suspect it might have been taken a year or two before Mary got married, so perhaps 1913 or 1914. According to this, William’s father was Archibald Elliott, a farmer, and his mother’s name was Mary Johnston. William was 70 years old at the time of his death, putting his year of birth around 1838. This information would have been supplied to the county registrar by A[rchibald] Elliott, William’s youngest son. We can use these names to delve into the Irish Census records. The state of the Irish Census in the 19th century is, unfortunately, a mess. Many of the census returns were destroyed, for one reason or another, and what we have are only fragments of what used to exist. The National Archives of Ireland give a brief history of the destruction on their website. We got lucky, though, and found what I believe to be the “right people” (i.e. my direct ancestors) in the Irish Census of 1841. The clues connecting this family with my grandfather’s grandfather’s family are overwhelming. The head of the family is named Archibald Elliott. His wife’s name is Mary (Mary Anne, to be exact). There is a 43-year-old unmarried woman living with them, identified as “sister-in-law”, named Hariett Johnston. This tells us that Mary Elliott’s maiden name must have been Johnston too. There is a 3-year-old boy living there named William, with a birth year of about 1838. The only thing to keep this from being a perfect match, though, is wee William: he is identified as Archibald’s grandson, not his son. William’s parents are not identified. — I am reasonably sure that this little boy is the same William who died in Paisley in 1908, my great-great-great grandfather, and that he believed that his parents were Archibald and Mary Anne. He might not even have been aware that he was actually Archibald’s grandson. This takes our family back to 1781, the approximate year of Archibald’s birth. I consider this quite a discovery. How William found his way to Paisley is unknown; our family’s oral history doesn’t mention it at all. But we can take a stab at it because his migration coincides with an important historical event: the Great Irish Famine. Since William was only 3 when we find him living with old Archibald, it’s reasonable to assume that he was born on or near Archibald’s place of residence, which was the town of Arva within the Townland of Drumalt, Parish of Killeshandra, Barony of Tullyhunco, in County Cavan, Ireland. William would have been 9 years old when the Famine arrived at his doorstep in Killeshandra Parish in 1847, and while he lived in a relatively prosperous area, it appears that there was hardship nevertheless (see this brief article on Killeshandra and the Famine). It is logical that young William would have journeyed 40 miles away to nearby Fermanagh to seek his fortune, where there was a seaport, a bustling industry, and many other people who shared the surname Elliott (who may have been related, although I don’t yet know how). There he married Mary Ingram, the butcher’s daughter, and started a family, but times were no doubt tough. People were leaving Ireland in droves in the 1850s, bound for North America and the industrial port cities of Scotland and England. For reasons we can only guess at William and Mary chose Paisley, Scotland as the new home for their small but growing family, and the rest is history. My grandfather John was a big fan of all things Scottish. He continued to speak with a brogue (or tried to) despite living in Canada for 64 years, played the bagpipes (until he chopped two fingers off, that’s another story), and wore a kilt at every opportunity. He styled himself “Head of the Clan” and hosted large family reunions at his acreage near Rocky Mountain House where there was bagpipe music and plenty of Johnny Walker Red (although purists might not regard that as proper Scotch at all, but I digress). There’s a good reason for all that Scottish-ness. He was, after all, Scottish. He was born in Paisley, an industrial city on the boundary between the Scottish Highlands and Lowlands. He grew up in the Highlands, though. His father was employed as a gamekeeper for the great estates and John, as the eldest son, helped his father as much as he could. The family lived in several locations across the Highlands in the decade following World War One (here is a Google Map I prepared of all the places they lived in those days) and John drank in the culture of those parts with gusto. It was a formative time for him and he remembered it with great longing for the rest of his life. In my post about The Family That Almost Was, I presented a letter wherein John alluded to a rumor that his grandfather had actually come from Ireland. I have subsequently conferred with various cousins and they, too, received wind of this rumor through their forebears, John’s brothers and sisters, so it must have been fairly common knowledge to that generation. Nobody, though, has been able to give me any details, so I suspect that a rumor is all it was to them. How to confirm or dispel that rumor? This contains lots of fascinating details, but the one to focus on here is the names of old John’s parents: William Elliot and Mary Ingram. Where did they come from? 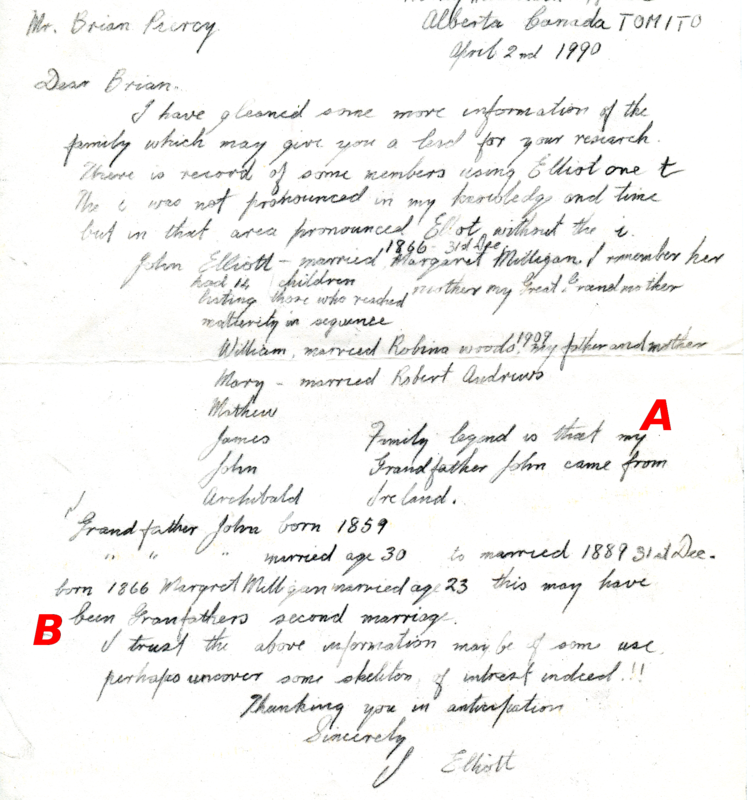 “Ireland Marriages, 1619-1898,” database, FamilySearch (https://familysearch.org/ark:/619031:1:FGCN-6JK : 12 December 2014), William Elliott and Mary Ingram, 09 Nov 1857; citing Lowtherstown, Ferm, Ireland, reference 506, index based upon data collected by the Genealogical Society of Utah, Salt Lake City; FHL microfilm 101,388. We cannot be 100% certain that this is the marriage we’re looking for yet, because those were extremely common names in that area in that time. But it gives us some clues: namely, that William Elliott’s father may have been named Archibald, and Mary Ingram’s father may have been named David. Making a long story short, I worked my way through all of William and Mary’s children using census, birth, death and marriage records, and discovered that the marriage record found on the LDS website is, in fact, correct: they were married on November 9, 1857 in Lowtherstown, County Fermanagh, Ireland, part of what was then referred to as the Ulster Plantation. 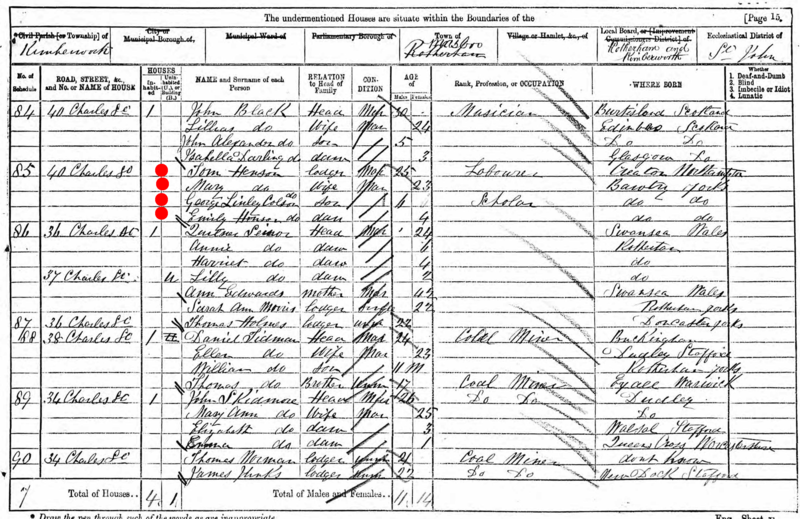 While I have been unable to find a birth or baptism record for old John (the Irish vital statistics search tools are not, I find, as easy to work with as the Scottish ones), it is clear from the Scottish Census that old John was indeed born in Ireland; the family first appears on the Scottish Census in 1871 when old John is 12 and is recorded to have been born in Ireland. He had a younger sister, Mary Jean, also born in Ireland about 1861. Between 1861 and 1864, it seems, the family moved from Ireland to Paisley, and 6 more children were added to the family, all of whom I’ve been able to trace through their birth, marriage, and death records. So, paydirt! We’re actually Irish. It’s almost enough to make “young” John (my grandfather) spin in his grave. But that’s not the end of the story. Read The Irish Connection, Part 2. 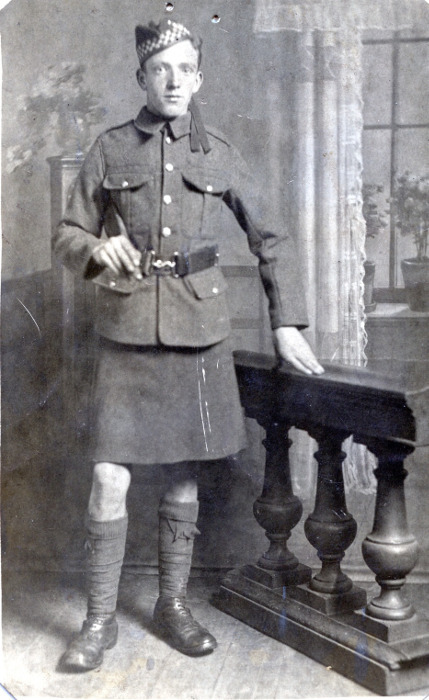 Today is the one-hundredth anniversary of the death of my great-uncle Frank (Francis Milligan) Elliott, 1/6 Argyll & Sutherland Highlanders, who died in a field hospital in France on May 21, 1917. In commemoration, here is a page I wrote that summarizes everything I have been able to find out about his short life. I’ve decided to resurrect this old blog of mine with musings about what I’m learning from genealogy. My grandfather, who died over a quarter-century ago, got bit by the genealogy bug a few years before he died, and he left behind some notes and charts of his research. Nobody else (including me) was at all interested in the family tree at that time, so his notes lay in a box all these years and never saw the light of day until my mother died recently and those papers came to me. I had already started my own research by then, and his notes were a welcome addition to my own growing body of knowledge. 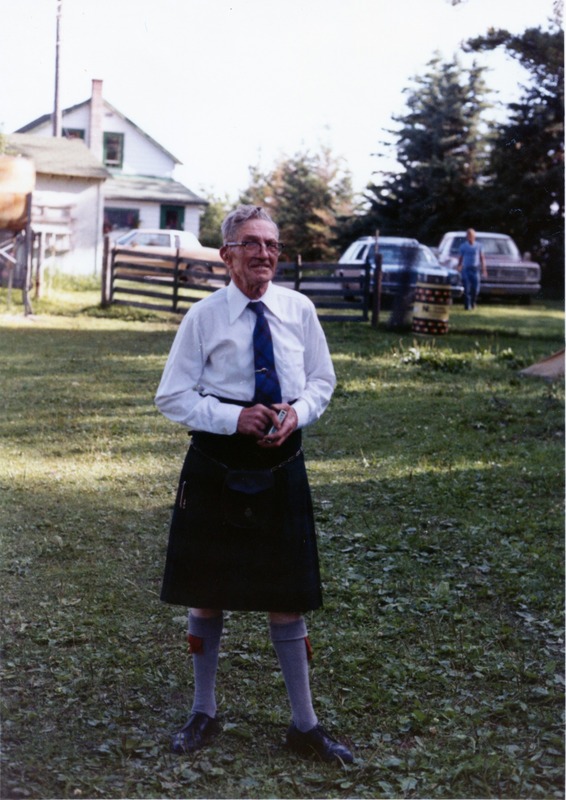 My grandfather, having left Scotland at the age of 17 and spending most of his life in Canada, had little knowledge of his roots beyond his own parents and grandparents and his cousins and uncles and aunts back in the Old Country that he kept in touch with (albeit infrequently). He started getting curious in his old age, so in early 1990 he wrote to his Uncle Archie back in Paisley with questions about the family history, and Archie provided a few details, but all in all it wasn’t much. My grandfather gathered up this information and sent it to the Elliott Clan Historian in Scotland, thinking that he might find something out that way. 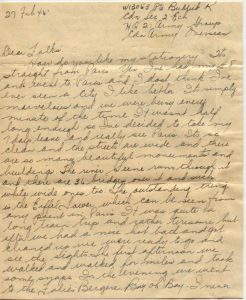 I have a carbon copy of that letter; it contains some helpful names and dates, and a couple of tantalizing pieces of news that I hadn’t known about. I have gleaned some more information of the family which may give you a hand for your research. There is record of some members using Elliot one t. The i was not pronounced in my knowledge and time but in that area pronounced Ellot without the i.
John Elliott – married 1866 – 31st Dec. Margaret Milligan. I remember her. had 14 children. listing those who reached maturity in sequence. mother my Great Grandmother. Family legend is that my Grandfather John came from Ireland. Grandfather John married age 30 to married 1889 31st Dec. born 1866 Margret Milligan married age 23 this may have been Grandfathers second marriage. I trust the above information may be of some use. Perhaps uncover some skeleton of intrest indeed!! A Family legend is that my Grandfather John came from Ireland. “Grandfather”– i.e. John Elliott Sr., 1859-1915, my great-great-grandfather, about whom I now know quite a bit– probably had very little schooling and worked at manual labor his whole life. 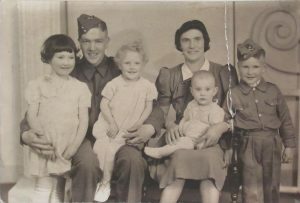 I’ve been able to trace his various addresses and occupations through the years using the Scottish Census and the birth and marriage records of his many children. For most of his life he was a brickfield laborer, and as he got older he became a “roadman” (a polite word, I believe, for ditch digger). He died on April 9, 1915 after suffering with a perforated gastric ulcer for a week. He was scarcely 56 years old when he died. I knew I had the right John Elliott because his parents’ names, William Elliott and Mary Ingram, matched what I had already learned. But the bride’s name was completely new to me: Agnes Scott, aged 30 (a wee bit older than the groom). She was a threadmill worker– Paisley was famous for the Coats Threadmill in those days (amongst other important industries). The bride’s mother, Agnes Gibb, was deceased by the time of the wedding (she died in 1875 after suffering from “Paralysis” for two and a half years). The bride’s father, William, was a Shawl Weaver. William, I have learned from various Census records, was born in Paisley around 1809, and his wife Agnes was born in Glasgow around 1813. The wedding ceremony took place at 64 Millarston Drive, Paisley, which was also the residence of both the bride and groom, so it seems they had already moved in together. The wedding took place according to the forms of the Free Church of Scotland which is interesting because I know from other sources that John’s family were Anglican, so Free Church of Scotland must have been the Scott family’s denomination. Witnesses were William Elliott (either John’s father or his younger brother, both of whom bore that name) and one “I. (or J.) Scott” (possibly a cousin of Agnes’; in the 1861 Census there is a Janet Scott living in William Scott’s household, identified as his niece). If we dig back in the Census records we see that 64 Millarston was actually the home of Agnes’ father William. In 1881 William’s household consisted of young Agnes (then aged 24, working at the threadmill), along with his son Robert (a Fire Clay Moulder) and Robert’s wife Mary, and their two children aged 5 and 7. 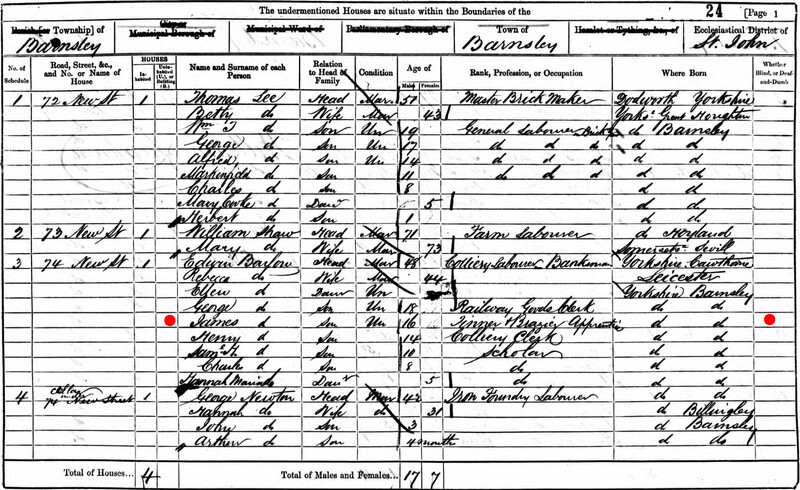 John, 22, was still living with his parents and seven siblings in the 1881 Census. And here’s the discovery that made me sit up and take notice: John and Agnes were next-door neighbors. John’s family and Agnes’ family appear on the same page of the 1881 Census; the Elliotts lived just a few doors down (at 62 Millarston). Furthermore, both John and his father William worked in the same industry as Agnes’ brother. I later confirmed (using birth records) that the Elliotts resided at 62 Millarston as early as 1867, when John would have been 8. The earliest mention I can find of the Scotts living at 64 Millarston is the mother’s death registration in 1875, when young Agnes would have been about 16 and John would have been about 14. The bottom line here is that the Elliott and Scott families were neighbors for at least 12 years, and perhaps longer. John and Agnes may have known each other since childhood. So, they finally decided to tie the knot late in 1887. Maybe John got Agnes pregnant and the wedding was forced; it’s not unlikely but impossible to know for sure. What happened then? Agnes and John went on living in her father’s household after their marriage. But sadly, less than four months after the wedding, Agnes quite suddenly died. Death Registration for Agnes Elliott (Scott), April 4, 1888. In mid-March she came down with something called Puerperal Peritonitis. This is (so I have read) a post-partum infection, not necessarily fatal, but frequently so back then. Since a stillbirth should have generated a registration of death, and I can find none in the archives, I surmise that Agnes must have had a miscarriage and then, on top of the sorrow of losing her baby, suffered from an infection for two weeks before dying at home. And with that, Agnes vanishes from our family history, along with the rest of the Scott family. This is pretty heady stuff to think about. Agnes might have been the mother of a big family, but instead she died and Margaret came along the following year and took her place. John and Agnes knew each other for a long time before getting married… What kind of bond did they have? Agnes’ father and John’s father must have known each other for at least as long; what was their relationship? Was religion a point of contention between them? Did the fact that Agnes’ father was a (skilled) weaver whereas John’s father was an unskilled fireclay laborer ever come between them? Or the fact that Agnes’ father was twenty years older than John’s father? Did the fact that William was born in Scotland but John’s family were immigrants from Ireland figure in it? I am throwing out these wild speculations for a reason: It’s puzzling that John and Agnes knew each other for so long but waited and waited and waited before getting married. They were, after all, unusually old (29 and 30) at the time of their marriage. My pet theory is that John and Agnes were long-time sweethearts but her father forbade them to marry because he didn’t think John was “good enough” for his daughter. When he finally relented, her advanced age contributed directly to complications that led to her death, obstetric medicine being as poor as it was in those days. Keep in mind that this is conjecture on my part, based on highly circumstantial evidence. There is absolutely no family oral history that I know of that supports my conclusion, and there are other ways to interpret the evidence. I wonder how much of this story was known to John’s second wife Margaret. 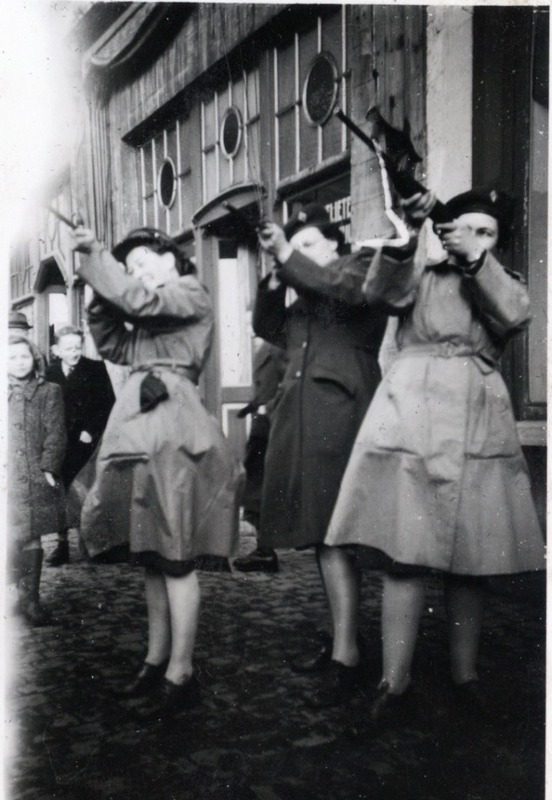 Margaret, though much younger than Agnes, worked at the Paisley threadmill too; could they have known each other? Been friends? Or is it possible that I, nosing around in the archives over a century later, actually know more now about John’s past than my great-great-grandmother Margaret did? For me, discovering all this was intensely sad, but at the same time exciting. I was glad to be able to bring Agnes’ brief story to light at last. Previously she had been nothing more than a rumor in a letter that few people knew about, but now at least she has a name. I always like hearing nice things about my work, but the remark about modality gave me pause. What does that mean? That’s not a word I ever learned at the Database School of Hard Knocks. What is Paul talking about? Modality, it turns out, is another word for what we database people call cardinality, or “the number of unique things in a set”. You might also hear it referred to as degree amongst erudite set-theory folks. When we talk about one-to-one relationships (or one-to-many, many-to-many, etc. ), we’re talking about the modality or cardinality of the relationship between things in different sets. In other words, one row in a table can be related to rows of data in another table. It doesn’t have to be, but it can be, depending on what real-world relationships you are trying to model. For instance, suppose you have a database of people, and EMAIL_ADDRESS is an optional field in your database. A person might have an email address, or she might not. We say there is a one-to-zero-or-one relationship, because one person can have zero or one email addresses. If, on the other hand, EMAIL_ADDRESS is not optional, the relationship becomes one-to-one because one person must have one email address. If, on the third hand, a person can have any number of email addresses, we call that one-to-many, because one person can have many email addresses. If the email address is still optional, we call that one-to-zero-or-many. Every A has exactly one B. Every B has exactly one A. Any A can have no more than one B; maybe none. Any B can have no more than one A; maybe none. Every A has one or more Bs. Any B has no more than one A; maybe none. Any A can have any number of Bs; maybe none. Every B has one or more As. Notice how the symbols (which are sometimes called “crowsfeet” for reasons that should be obvious) change the cardinality of the relationship. You should understand that this is not an exhaustive list of entity relationships, and again, there are many different sets of symbols out there. So what’s all this got to do with my tutorial? Every customer can have any number of orders; maybe none. In other words, a customer could exist in the database without ever placing an order. I call this a “problem” rather than a “mistake” because there are lots of databases out in the real world that have customers who have never placed an order. Although logically, the definition of “customer” is “someone who has bought something from you”, I can think of all sorts of reasons why you might want to keep track of order-less customers… maybe their order is pending. Or maybe the customer is just a sales prospect, in which case they should perhaps go into a PROSPECTS table, and then migrate to CUSTOMERS after the order is made… or maybe you could add a STATUS field to the table to differentiate between pending customers, prospective customers, and actual customers… The possibilities are delightfully many, as are the possible solutions. But guess what? I don’t care. At least not in the context of my tutorial. I wanted things to be clean and simple– I just wanted to model a stack of invoices, where every invoice has a customer, and every customer has made a purchase. But by selecting the wrong crowsfoot symbol, I introduced a whole big mess that would need considerable explanation that would dilute the simplicity of the tutorial. So, what to do? Easy; just change the symbol connecting CUSTOMERS to ORDERS. Here’s my new Figure J. Every customer has one or more orders. I’m grateful to Paul for pointing out this inconsistency.